High winds, water, and age can take a toll on your roof. Therefore, it makes sense that regular inspections are essential for preventative maintenance. Doing so can save you a lot of money, time and frustration down the road. Typically, roofing experts say that a roof should be inspected at least annually. Many even encourage inspections twice a year; one in the spring and one in the fall. This is not to say that you need to haul a ladder out of the garage and climb up onto your roof once or twice a year. You can effectively inspect your roof from the ground, using binoculars or even a phone with a good camera. The important thing is that you’re able to have a good, clear look. Check for cracked or curled up shingles. Often, the wind can loosen shingles over time. Problems such as popped up nails should be noticeable from your vantage point. These issues should be handled as soon as possible, since a strong gust of wind can easily lift off an entire patch of shingles, when allowed enough space beneath them. Also, inspect joints for any cracks or gaps. Roofs with skylights, pipes and chimneys can be problems waiting to happen if the joints are not properly sealed. Inspect along the edges of the shingles where they meet the flashing or rubber boots. Make sure these seams are tight and there is no evidence of leaks. 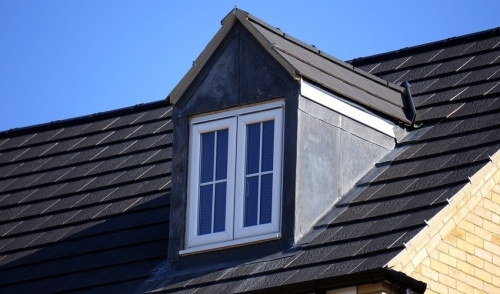 Ventilation is important to your roof. If the attic is not properly ventilated, then heat and moisture can build up in the attic, potentially ruining both the roof decking and the roofing material. Check the soffit, gable, and ridge vents to ensure that air is able to move freely. Another issue that you can detect without needing binoculars is the evidence of loose shingle grit. Take a walk around your home and look at the ground where your gutter downspouts are located. If you see any piles of colored grit, this is a sign that your shingles may have begun to deteriorate. Aside from annual inspections, there are other times when inspecting your roof is necessary. Particularly when certain things have occurred that could’ve potentially damaged your roof. In situations where high winds have passed through the area, it is a good idea to look for lifted or missing shingles. Additionally, branches and other debris could have struck and damaged your roof. Hail is also known to damage roofing material. If you notice hail larger than a marble, it’s worth taking a look. Also, if you have reason to believe that lightning may have struck your home or a tree next to your home, then once the storm has passed you should take a look at your roof to see if there was damage. Of course, if you notice any roofing material laying in your yard, such as fallen shingles, action is needed. The scope and expense of that action depends on the cause. If it was due wind or fallen debris, then repair is in order. However, if it was due to age or improper installation, then the job could be somewhat larger.